The color of your car won't lower your insurance premiums. 1. Does Being Self-Employed Affect Car Insurance? 3. Can Your Homeowners Insurance Company Cover a Stolen Vehicle From Your House? Automobile insurance is designed to protect you against financial loss if you experience a covered event. The type of coverage you purchase is the major factor in determining how much you pay for your policy, but other factors can lower your auto insurance bill. One thing that won't reduce your premiums is the color of your car. Most insurance companies don't even ask. A popular and persistent myth about car insurance is that red cars have higher rates. Another myth is that a white car costs less to insure. The idea is that people who drive red cars might be more inclined to take risks, while people who choose white are more conservative with their driving habits. There is no research to back up either myth. The reality is that color has no bearing on the amount you pay for car insurance. As with most rules, there is at least one exception to car color not affecting insurance rates. Your insurance company might tag you with a rate increase if your car has a custom, one-of-a-kind paint job. As long as your car has a factory paint job, whether it's green, blue, red, black or white makes no difference to your insurance company. One of the primary factors that determine how much you pay for car insurance is the type of car you drive. Your insurance company bases your premiums, in part, on how much the car costs, the size of its engine, its likelihood of begin stolen, the type of safety equipment it has and the average cost of repairs for that particular make and model. The other major factor that determines your insurance rate is you. Your driving record, your age, your gender, your credit rating and the purpose for which you operate your car all play a part in your premium. 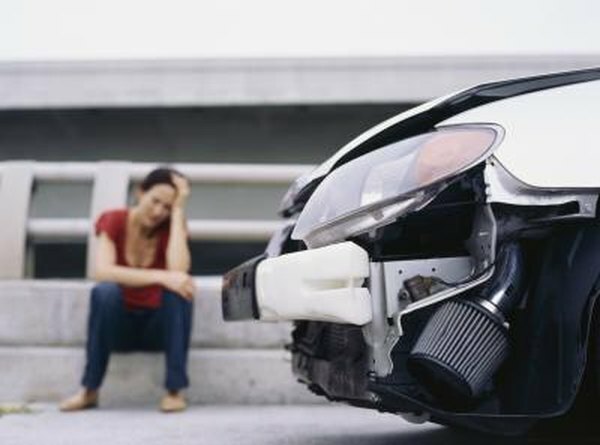 Women tend to have fewer accidents than men, so as a group, their auto insurance rates are lower. Mature drivers tend to have fewer accidents than teenaged drivers, so as a group, teenagers pay more for auto insurance. Regardless of the group you belong to, if you have a lot of moving violations or are involved in a number of at-fault accidents, your insurance rates will go up. Insurance Information Institute: What Determines the Price of My Auto Insurance Policy? Car Insurance 101: Are Red Cars More Expensive to Insure?